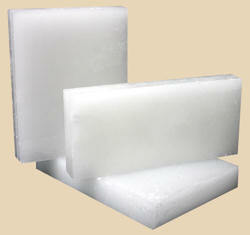 All paraffin waxes are flammable, and may give off volatile vapors when overheated. These vapors may cause sudden, dangerous FLASH FIRES. To reduce the risk of overheating, NEVER heat or melt paraffin wax directly over a heat source. Always use a double-boiler system. To reduce the risk of overheating, keep the heat setting to medium. It's just better to take the time to safely melt the wax. As the wax melts, monitor its temperature with a thermometer. If the thermometer indicates wax is overheating, or white vapors rise from the melted wax, remove the wax from heat immediately. Keep a non-water-based fire extinguisher nearby when melting wax. 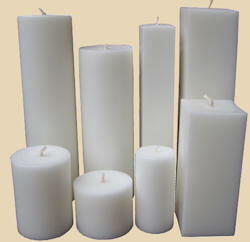 Aristowax 143 is a versatile general-purpose paraffin wax ideal for pillars, tapers, and chunk candles. You can use it with or without additives, as you choose. Without any additives, this wax is very translucent and produces a charming glow when lit. Not brittle, and strong enough to hold its shape in vertical forms. Fragrance load should be 3% or less. That equals 1/2 liquid ounce or 3 teaspoons, per pound of wax (or 15 milliliters to 454 grams). Higher fragrance levels give better mottling, but levels above 5% may result in excess surface oil. Not sticky or oily to the touch. Exact melting point varies slightly, between 138-143°F. Exact weight per slab may vary slightly. Keep lit candles away from drafts, fans or breezes to help them last longer. Aristowax 125 is also a versatile general-purpose paraffin wax, like AR143, but it's formulated to melt at a lower temperature. The lower temperature makes it ideal for container candles of all kinds, but it is too soft to use in vertical or free-standing shapes. It will sag, warp, or melt, especially if exposed to heat sources or sunlight. 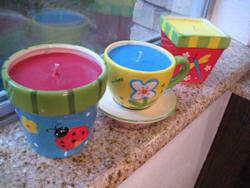 Wax for container candles should not be used in molds: it's soft enough that it may not release well from the mold. Slightly oily or slick to the touch. Exact melting point varies slightly, between 125-130°F. 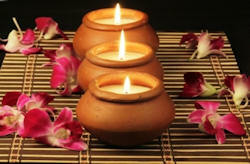 Many people have discovered an attractive alternative to paraffin in SOY WAX. Soy wax is a processed form of soy oil, extracted from the shells of soybeans. Across the web you'll find many claims of benefits to using soy wax instead of paraffin wax, while others argue pretty much the exact opposite. If you encounter these conflicting claims about soy wax, bear in mind there are no standard labeling regulations or requirements for soy candles. This pure, 100% natural soybean-based wax is enhanced with carefully selected botanical oils. An incredible wax that is biodegradable, environmentally friendly, and easy to use. Pour once and let it cool for a level surface with excellent "stickiness" to the sides of the candle container. Square braid wicking recommended by the manufacturer for this wax. This wax is compatible with most dyes and fragrances. Mixing with other waxes is not recommended. 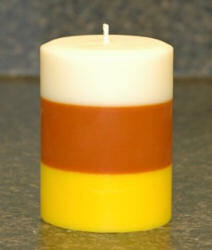 Keep wick trimmed to 1/8" above candle surface for best burning results. This container wax has a melt point of 110°F and a recommended pouring temperature of 130°F (may vary depending on container type and size). This pure, 100% natural soybean-based wax is enhanced with carefully selected botanical oils.Biodegradable, environmentally friendly, and easy to use. Pour once and let it cool for a level surface in the mold. Larger candles may require an additional pour, depending on use and desired look. Self-releasing from mold, but molds may require "conditioning" before first use. This container wax has a melt point of 140°F and a recommended pouring temperature of 165°F (may vary depending on container type and size).